I'm sitting here on my couch. Not even playing my surround sound system. I hear a couple popping sounds and can smell something burning over by my EP500. I also have a cheap lamp over there, but I dont think that was it. freaked me out. I checked the cords behind the lamps and they were fine. The EP500 still plays fine. The smell went away. I'm wondering if there has been any issues with capacitors blowing in these units ? I'm thinking my EP500 is 3-4 years old. Still under warranty I really dont abuse my axiom/denon system, its quality over quantity of sound for me. The only issue I have had is a ground loop thru the sub. I moved here 1.5 years ago and it started after that. I traced it down to the incoming cable tv line. I tried an isolation filter on the cable line (Basically a capacitor ), but then the signal level on the cable was poor. The cable tv service rep was wortheless, said his power was clean. I eventually removed the chassis ground screw on the EP500, as outlined in the manual. This reduced the hum by 95% which was pretty good. I dont know what to do now. I wanna take apart the sub to inspect the electronics, but dont want to void my warranty. Maybe it was the lamp, I did just change the bulb in it today. the bulb is still good. Anyone else have an experience like this ? I think 90% of the time ground loops can be traced back to the incoming TV source outside of the building and it seems to me like most everybody spends all of their time indoors looking for these loops. Randy if I were in your shoes I'd take anything the chucklehead CATV installer said with a grain of salt and go outside to the incoming CATV source and physically inspect each and every grounding block, nut, bolt and wire with a tug of pliers or a tap with a hammer. I'm betting you'll find a connection loose, corroded or not connected properly. 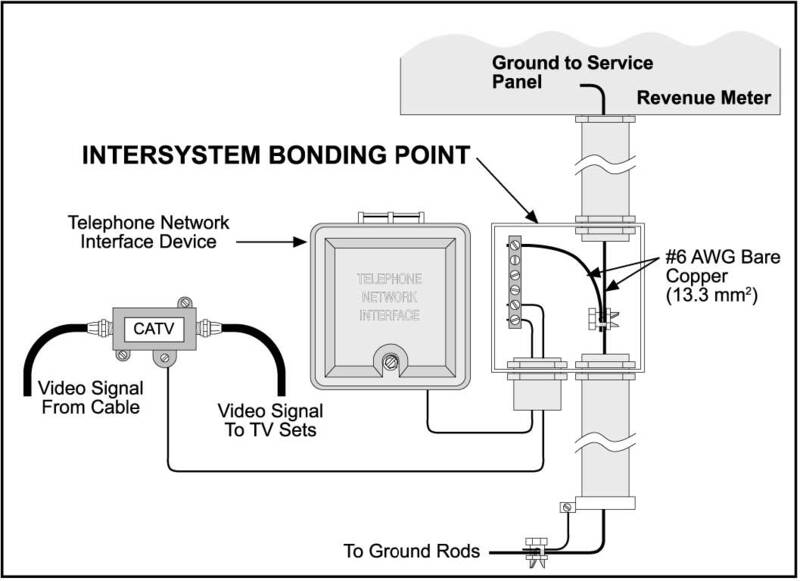 If you do that and properly connect the wires using the CATV grounding diagram linked below I can pretty much guarantee you that you'll solve your grounding issue, until the chuckleheaded satellite installer installs the satellite dish. Regarding the sub, put it through it's paces and if something's not right I'd certainly give Axiom a shout. I had a ground loop hum that was caused by my cable TV. I purchased a ground islolator from axiom... I even convinced my cable company to pay for it, but it took a little persuasion! I did a little sniffin' around. If I put my nose right by the EP500's electronics I still get a faint smell. The sub's still working. The green light is on. I put on some I aint your repo man ( though This is the Ray Lamontagne song that's sustaining me right now), and smelled the air coming out the port in front. No smell. So then I thought maybe the electronics are sealed. sure enough . My thoughts are that it aint the voice coils. I'm just gonna wait for them to call me back. Since I aint posted for awhile I took some pics of my setup . I'm quite pleased with the stereo separation and the height of the rears. As far as the ground loop. I live in a single story patio/garden type apartment complex. There's 4 appts under my common roof. each appt has 2 cable connections coming from outside. I'm not gonna mess with it outside. I canceled the tv part of my cable when I got laid off. However, since they are going to all digital with a DTA , they must not feel compelled to put on filters. I got a nice setup with mythtv/haupauge 950q/scte65scan. We're gonna let that dog sleep. I mainly mentioned the ground loop with regards to my EP500 issue. anyone had any EP500 issues like this, specifically after the infant mortality period has passed ? As Rick mentioned, it would be best to talk with an Axiom representative re the sub/amp. Nice setup you have, Randy, very clean looking....oh! and your parakeet's a handsome little fellow too. I got a call back from J.C at Axiom. After describing issue he verified my warranty and asked for me to send him a pic of the back my sub. I'm guessing they got a couple rev's of the amp. An email is forthcoming with further directions. It looks like I am getting a replacement amp. He didnt go into details as to what he thought happened. I'm lucky I was sitting here when it happened. The popping wasn't real loud nor the smell overpowering. If I was in the other room I would have missed it altogether. I never would have known a gremlin was at work inside my sub's amp as the sub is still working. I havent tried to adjust the crossover/gain/other settings to see if anything went out since I still got some bass right now. Its funny I dont even get upgradeitus anymore. But I would like to have another set of M22 to put in my bedroom. Does that count ? That way I wouldnt have to play the game " guess the name of this song by the bass line" when I am in the shower. Well, technically buying a new pair of M22's is in fact an upgrade since Axiom has recently released V3!! make note to self to locate used pair of TI so all are matching. I'd like to get a pdf of the user manual for my V2 EP500 and for the M22ti. anyone know how I can get the old versions. I dont have the hard copies anymore ? And JC called back . Axiom set up a prepaid ups label for me to return the defective amp. $30 isnt bad considering the weight. Glad they got away from DHL or whomever it was back in 2007. Couple of my boxes were torn up, but the insides were golden. He didnt have any opinions on what may have went wrong with my unit. I'd like to see what burned up but notice a funky allen head bolt. so I surmise they dont want you in there poking around. I'll flip the knobs around to see what gives before sending it back. might even break out my audiocontrol sa-305x analyzer. I can never remember X. I think its 0 or 2. Had a new one of these in mid 90's. sold it for a different lifestyle. bought a used one last year off ebay. works but has it quirks. need to send it back to AC to get it gone over. well let me browse around now, curious bout the V2/3 of ep500. now I see there is a VP180 center channel. thats sweet . I hereby revoke my lack of upgradeitis. Randy, all the EP500s have class D amps which operate by switching on and off several hundred thousand times a second, but there's nothing digital about the basic operation. "D" is simply the amplifier class that follows C.
There's no internal crossover, just a variable low pass filter. It can essentially be bypassed from interfering with the lower frequency crossover which a receiver does if the filter is set at the 150Hz max. My diagnosis is that you'll remain upgradeitis-free if you just buy new M22s for another setup, not to replace the current ones. Thanks for the reply. I've been looking over some threads and it appears that when I set my crossover ( err. var lp filter ) at bypass it is really at 150hz. I'd have to look at what my crossover at the denon is set at, and get the DB per octave (# of poles) of the denon and the sub amp's crossover ( err variable filter ) to see if technically 150hz crossover is the same as bypass. I imagine it's not but my ears cant hear the difference. but if you know of a post that details the difference in amplifier, difference in input power required for the same output, and freq response of ep500 v2/v3 , I'd like to see it. can you point me to where it lists which axiom sub amps are class D ? ps you're right about the upgradeites. I think V3 would be fine, or even v2 if the price was right. pss. i saw where the upgrade program was degraded. I can understand from Axioms point. I'm grateful I was able to utilize it when I did. I couldnt of upgraded without it. wikipedia says " The term "class D" is sometimes misunderstood as meaning a "digital" amplifier. "